(2) These values are measured by gearbox with ratio 100 (2-stage) at 3,000 rpm no loading. (4) Applied to the output shaft center at 100 rpm. (5) Continuous operation is not recommended. (6) These values are measured by gearbox with ratio 10 (1-stage) or ratio 100 (2-stage) at 3,000 rpm no loading. By lower ratio and/or higher RPM, the noise level could be 3 to 5 dB higher. 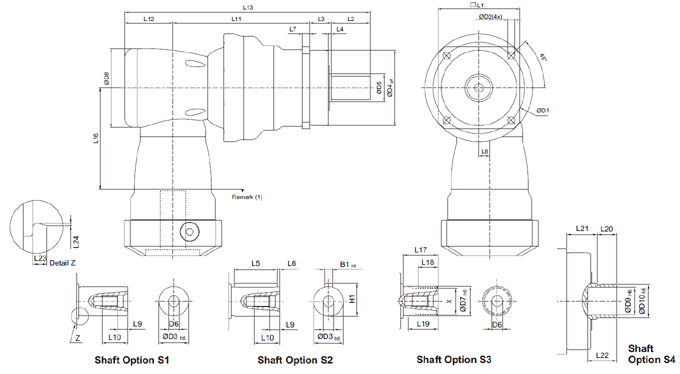 (A) Ø = Input shaft diameter. (1) Dimensions are related to motor interface. Please contact APEX for details.